Sober Look: Is ethanol impacting gasoline prices or are we looking at more political hype? Is ethanol impacting gasoline prices or are we looking at more political hype? Bloomberg/BW: - The Obama administration is reviewing the country’s ethanol policy amid calls from both political parties and the United Nations to suspend annual targets as the worst drought in 56 years spurs corn prices. How material is the risk of US gasoline prices being impacted by the spike in corn prices or is this just a political maneuver on both sides of the isle? After all we are in the midst of what could turn out to be a close presidential election and such petitions should be taken with a grain of salt. Based on the latest data, it turns out that these politicians are full of hot air. According to the US Energy Information Administration (EIA) the US ethanol production is expected to be reduced by only about 3%. EIA: - EIA has reduced its 2012 ethanol production forecast from 900 thousand bbl/d (13.8 billion gallons) in last month’s Outlook to 870 thousand bbl/d (13.3 billion gallons). 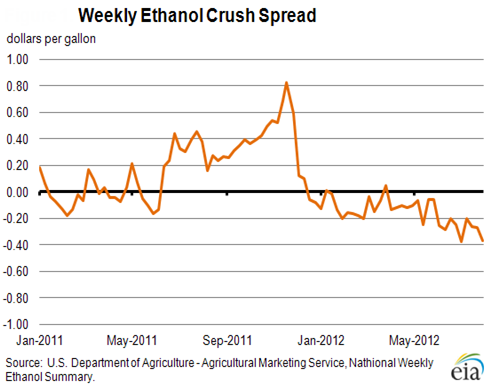 EIA expects ethanol production to recover in the second half of 2013, averaging about 880 thousand bbl/d for the year. This decline in spread means that ethanol prices are sufficiently sticky and will not rise in proportion to corn prices. And the 3% expected reduction in ethanol prices will simply reduce ethanol exports. EIA does not expect the current situation in corn markets to have a significant effect on the pump price of gasoline. Given the year-to-date ethanol supply and the availability of banked renewable identification number (RIN) credits, the current relationship between the prices of ethanol and petroleum-based gasoline components, and the relatively modest share of ethanol in the overall gasoline pool [10%], we expect gasoline prices will continue to be driven by crude oil prices and refining margins. The impact of the forecasted decline in domestic ethanol production should be primarily reflected in reduced ethanol exports. So when politicians begin taking credit for reducing gasoline prices by pressuring the EPA to relax the ethanol rules, it's nothing more than political gamesmanship. Changing the mixing rules will do little to impact the cost of gasoline because it's not ethanol but crude oil prices that determine how much we pay at the pump.